Motor is based on an S&S “74XLSS” kit, which the previous owner had installed by an HD dealer in 2003. I purchased the bike about 6 yrs. ago; switched out the Andrews N6 cam which came with the kit for the Woods cam, and changed a Vance& Hines exhaust to the D&D. Chart was done a couple years back when the motor had about 20K miles on the conversion. 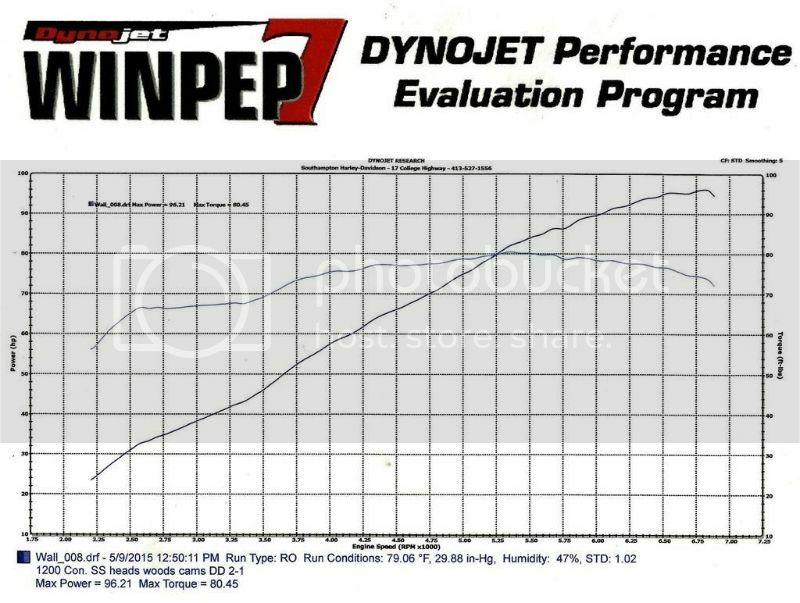 It has not been professionally tuned, just some time on the Dyno at the HD dealer working with the jetting. Not bad results, all components are "off the shelf" without any modifications. This cam could use more compression, about 11.0-1 is supposed to be what it likes, so a change to a 0.030 head gasket next time the top end comes apart is in order. Congrats on the nice result! That'll get it done!